Summer is the perfect season for relaxing, recharging, and pampering yourself, and the Christienne Fallsview Spa has a number of new products and incredible treatments which will help you do just that. One of the most exciting new products currently retailing at the spa is the Phytomer’s Tresor Des Mers, a luxurious dry oil that enhances face, body, and hair. This oil has a wonderful satiny texture and is made up of a blend of five natural and moisturizing marine and vegetable oils, which work to nourish and repair. It is subtly golden and has a summery fragrance, making it the perfect beauty elixir to pick up as a gift or for yourself this summer. Other great products now being carried at the spa include a range of amazing nail polishes from Spa Ritual. These nail lacquers are all vegan and formulated without DBP, toleune, and formaldehyde, making any manicure or pedicure at the spa into something spectacular. Spa Ritual has so many amazing colours to choose from and all of their products promote personal and planetary well-being and are sure to make you look and feel fabulous. The Christienne Fallsview Spa is also currently carrying a brand new sunscreen from LaSpa, which is made from natural minerals and is a healthy alternative to traditional chemical-based sunscreens. This SPF 30 lotion is 100% natural, fragrance free, and perfect for sensitive skin. It will keep your skin smooth and protected with essential oils and no gluten, soy, parabens, or chemicals. 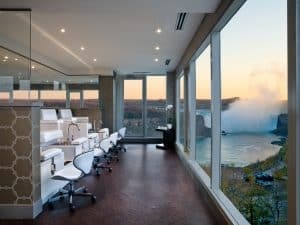 Stop by the Christienne Fallsview Spa to find all of these amazing products, a wide range of relaxing and rejuvenating treatments, and a breathtaking view of Niagara Falls.